As magical as the Grand Canyon is from the top, peering down into red and purple shades of rock so far down your eyes lose an ability to judge the distance, it is yet more magical from the very bottom peering up. Perhaps because of the feeling of accomplishment that comes from a journey down, and perhaps from a feeling of quiet, peaceful seclusion from the modern world. Whatever the reason, it’s well worth a trek down just to spend the night at the bottom in either Phantom Ranch or nearby Bright Angel Campground. It may not feel that way as you wade through the tedious reservation process for Phantom Ranch, but that is not the logistical detail I’ll be going over in this post. 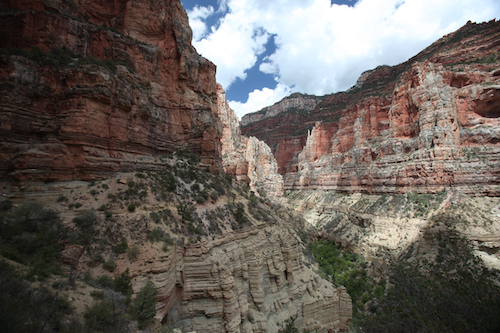 In this post, I’d like to give a little bit of insight for potential hikers trying to decide which trail to take, as there are 3 major trails leading down to the bottom, North Kaibob, South Kaibob, and Bright Angel Trail. Having hiked the entirety of each of these trails at some point, I’d love to give a hiker’s perspective. Bright Angel Trail is probably the easiest trail to recommend because of its frequent water stops and moderate distance. Hikers who are not interested in going all the way down to the bottom of the canyon can hike down to the Indian Gardens region 4.9 miles down instead. But what this trail is especially good for is the journey back up, regardless of which trail you’ve taken down. While it’s not the shortest of the trails we’ll talk about, it is the shortest one with water stops. Both of these details are extremely important for an upward journey. 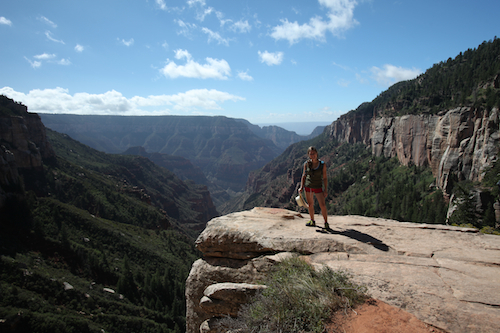 Hiking up the canyon can take significantly longer than hiking down and can be far more fatiguing. The atmosphere of this trail is interesting as well. It will lead you through a quintessential red-rock desert type of environment until you reach the lush area of the Indian Gardens. After this point, you descent towards the river and complete the last part of your journey walking alongside it. 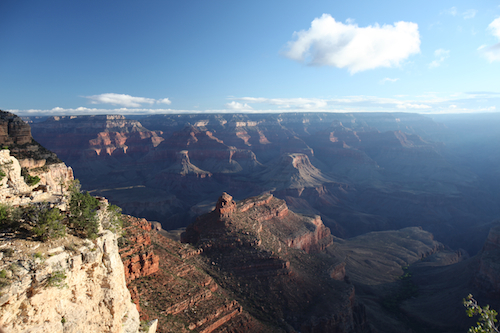 Access points: Bright Angel Campground and Yaki Point along the South Rim. I chose this for an ascending hike one year and it was the most difficult Grand Canyon hike I’ve done. It is steep, has no water stops, and leads you through a dry, winding cliffside that offers little relief from the sun at times. Hikers who choose this route should be very intentional and realistic about the supplies they pack with them. It is indeed a shorter hike, as the shortest of the trails we’ll mention today, but the most strenuous one, so take this into account. I recommend this trail mostly for descending. Particularly if a person is concerned about making it to the bottom in time for a scheduled dinner. (All meals at phantom ranch must be reserved and fall into a strict schedule). And while it’s not impossible to use this trail for ascending, it’s not to be taken lightly. Access points: Phantom Ranch and the North Rim Trailhead. I chose this one to discuss last because it is my favorite, and I’d like to share a piece I wrote about it after hiking it last month. But first, the logistical details: This trail is the longest of those mentioned today. Significantly so. And yet, it is not a strenuous 14 miles comparatively. It is not as steep, and the environment transitions frequently. There are plenty of water stops and as long as you are providing a realistic amount of time for the hike (anywhere from 5 – 9 hours), this is a wonderful choice for a descending hike. Anyone considering this hike for the ascending trip should remember that ascending hikes take significantly longer than descending. This is not a very popular trail, as the only trail leading up to the North Rim, but I’d like to reference the thoughts I made in a post last month to advocate for this trail as a favorite. “The North Rim is quiet. If you stand and listen for a moment you don’t hear the chatter of a high traffic tourist destination as you would on the South Rim. Instead you hear the wind through the pines. In fact, the beginning of your trek does not feel like quintessential Canyon red rock dust and desert. Instead you’re in a gentle pine forest. In fact the first stretch of the North Kaibab Trail hike begins in this setting until the vegetation shrinks back and you can see the height of the cliff you’re standing on. The view opens up and you make your way down along cliffs into the floor of a side canyon. And then the landscape changes again. Every few miles, in fact, the landscape of the North Kaibab seems to change into something new as the canyon walls rise around you, layering back until the rim disappears behind the cliffs nearest your path. These early miles of the trail find you descending through an ancient solidified display of the earth’s history- a core sample of the layers of earth in front of your very eyes till you reach the most ancient layers of subtly glittering Vishnu Shist, so ancient it lacks any traces of organic, biological matter. This amazing artifact of geological history lines the later miles of the trail like gravel, kicked along humbly by the feet of hikers. This is also where you reach a little canyon creek that slips like melted glass through desert rock and brings green life wherever it goes. Most of the remaining 7.2 miles of the North Kaibab follow this creek. As I looked at it, I wondered at how different it seemed from the forest creeks I grew up with in Ohio, clouded with decaying plant life and stirring up mud. This water, cupped by canyon rock seemed more pure and more lively. And the plants that line the banks are so foreign to someone who grew up far from the desert. Prickly, spiny, spindly little plants keeping themselves as inward as possible, not spilling out clumsily into one another like the leaves and grasses of the east. Orderly, linear plants. The creekside portion of this trail levels out significantly and you find yourself anticipating each bend will reveal the little cabins of Phantom Ranch. Great advice! I hiked South Kaibob down to Phantom Ranch and Bright Angel up. The lack of water on the South Kaibob was a problem for one of my fellow hikers. I would definitely repeat this experience as it showed me how much I could push my body. Thanks for the great article and beautiful pics!